Vivo announced its follow-up to one of the most head-turning phones of 2018, the Nex. 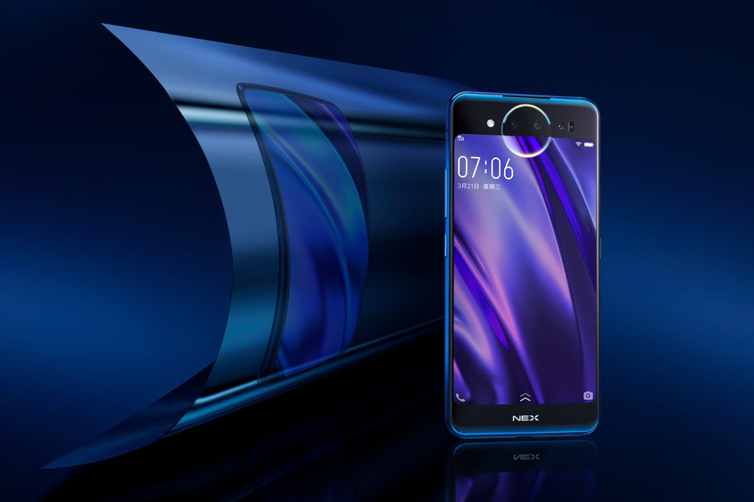 The new Nex Dual Display Editionhas a curvy design and no display notch, but it takes a different approach: whereas the original Nex had a pop-up selfie camera, the new model doesn’t need one because, there’s an entire second screen on the back of the phone that can frame selfies with the unusually ringed rear camera setup. Vivo has a 12-megapixel primary camera backed with a 2-megapixel secondary module, and a third f/1.3 lens paired with a time of flight (TOF) 3D module. Vivo says the TOF 3D camera adds point-to-point distance measuring and secure facial recognition to unlock the rear display. The company showed off the 3D object-scanning capabilities of its prototype time-of-flight tech at MWC Shanghai this year. ​Figure 1: Backside Display with Lunar Ring. ​The “Lunar Ring” on the back of the device is functional as well as decorative. The colors can change to signify notifications or glow softly to create diffused lighting for low-lit selfie shots. It can also be set to pulse along with music. The front screen is 6.4-inches with 2340 x 1080 resolution, while the one on the back is a 5.5-inches FHD display that can be used to operate the phone normally. Both are OLED panels, which enables the in-display fingerprint sensor that Vivo has done more than anyoneto popularize this year. However, it still doesn’t work across a wider area like we saw with the Apex concept device that eventually became the Nex. Vivo thinks the two displays could be useful in a few (dubious) scenarios. For example, during the Nex’s unveiling, the company showed the second display being used as a rear touch pad for gaming. It also demonstrated a mirror mode that allowed the photographer and human subject to see how the image was being framed simultaneously. Likewise, a Nex owner could draw a heart on one side of the device to communicate their feelings to a person on the other side. As for the internal specs, there’s a Qualcomm Snapdragon 845 processor, 10GB of RAM, and 128GB of storage, while the battery has been cut from the original Nex’s 4,000mAh to 3,500mAh. The phone supports 10V fast-charging over its USB-C port. And it has a headphone jack. Overall, the Dual Display Edition is a more refined version of the Nex that still keeps the series’ spirit of experimentation. It isn’t a major upgrade in every way. Vivo hasn’t yet announced pricing or availability for the Nex Dual Display Edition outside of China, where it’ll go on sale on December 29th for 4,998 yuan, or about $725.